The border town of Mae Sam Laep is sited along the banks of the Salween River where it comprises the political border with Myanmar. 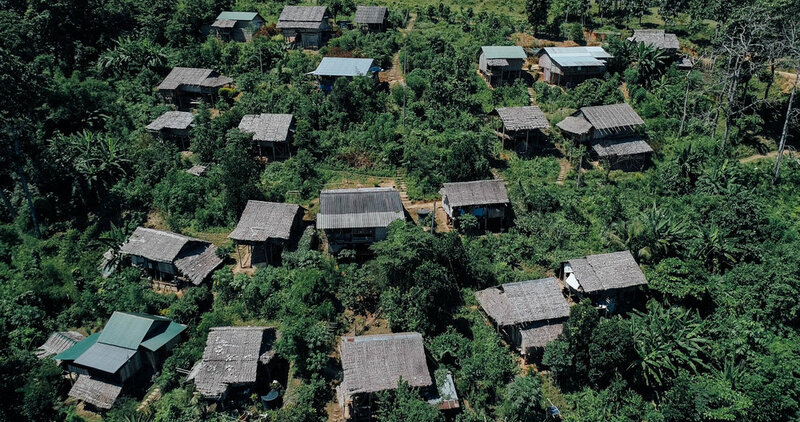 A small town of 280 households located within the province of Mae Hong Son, a local census in 2007 recorded approximately 1,500 full-time residents. The community is diverse, a mix of Shan, Thai, and Karen ethnicities from a range of faiths, including Christian, Buddhist, Animist, and Muslim religions. Above the mooring place for boats, a line of small shops sit on the high ground overlooking the Salween River. Here, they sell a variety of foods, and have on display a range of goods from diverse places and made by different ethnic groups. For instance, you can find fabrics from Shan and Karen states, as well as Chinese toys and Thai clothing, as well as fresh fish from the Salween River. 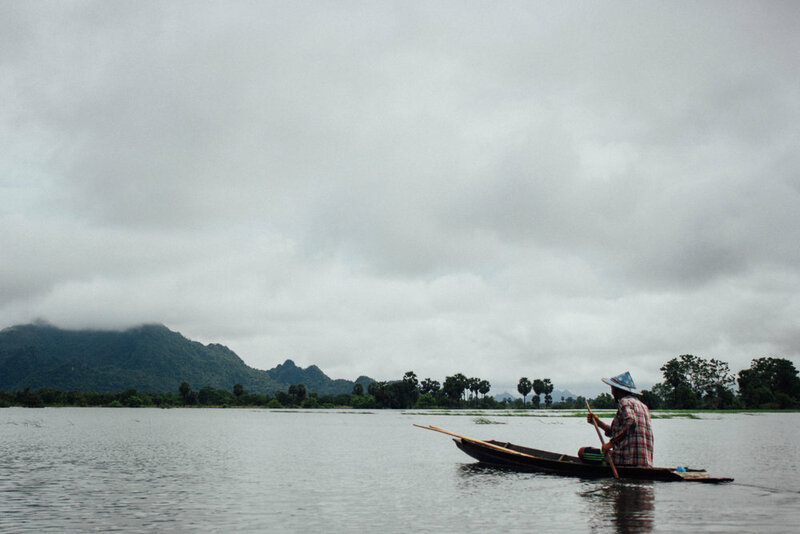 A long time ago, it was the Lawa ethnic people who used to live along the Salween River. Lawa people worshipped a sacred rock, but as the time went by the sacred rock was forgotten and the younger generations of Lawa turned their back on it. The sacred rock’s anger soon turned into resentment, and it lifted itself off the ground to chase all of the Lawa along the Salween River. The sacred rock laid waste to many villages. The Lawa who made it out alive escaped to higher ground away from the Salween River. Even then, the sacred rock was relentless in its pursuit of the Lawa into the uplands. When it arrived at Mae La Noi village, in Southern Mae Hong Son province, it met an older sacred rock who persuaded it that all the Lawa people were now dead and that it should stop its pursuit and rest there, which is where it can be found today. However, the Lawa people who still live in the area until this day believe that the sacred rock is still after them. They avoid getting too close to the sacred rock. If they must be close, they do not speak Lawa or act like a Lawa so that the sacred rock does not recognize them. According to this myth, it was only after the Lawa had been chased from the Salween River that other ethnic groups arrived, including the Karen, Tai, and Hmong. Mae Sam Laep is located in Mae Hong Son Province, Thailand and it can be reached by multiple overland routes. There are a few options for buses. The one that I took was an overnight bus from Bangkok that took about 12 hours to get to Mae Sariang, which is a big(ish) town in the area. To get to Mae Sam Laep from Mae Sariang, even though it's only 60 kilometers away takes around 2 hours by car. It will take longer if you ride the local song teaw (pick up truck with two rows of seats in the back), but it's definitely worth the trek. While visiting Mae Sam Laep town with Laofang, a local lawyer and environmentalist, I was introduced to Tee Sae, a Karen boatman who had lived in the village since he was 12 years old. Tee Sae told me that he moved from Myanmar because fighting broke out between the Karen National Union army and the Tatmadaw (the Myanmar military). He told me about the history of Mae Sam Laep town, and the challenges and opportunities there. Over a couple of days in two separate trips with Tee Sae, I had an opportunity to learn what life is like along the border. Laofang parked his truck in the middle of a busy downtown road in Mae Sariang, now consisting of three motorbikes queued behind him while a couple of monks walk towards several villagers, who are kneeling and waiting patiently to provide breakfast for them. It is six in the morning, and about an hour earlier I had been dropped off by the town's bus terminal, which is on the side of the road close to a local grocery store. Mae Sariang was asleep then, but now it's coming alive as local people bustle to buy fresh ingredients for their day’s food preparations. Laofang is a local lawyer turned environmentalist and a Dizi (Chinese Flute) enthusiast. He mentioned that he wanted to share his expertise on the Dizi but the reed was broken, and it's rather hard to find a new one in Mae Sariang. He drove me back to his home, which is also his office, so that I could freshen up before we would head out together to explore the Salween River relatively nearby. Laofang grew up in Mae Hong Son, studied here through to high school, and, in his words, was "lucky enough" to be accepted into the Faculty of Law of the prestigious Chiang Mai University. After completing his studies, he started to volunteer with a local non-government organization who focused on youth and community development, and it was here that he found his true calling. Between phone calls as we are on the move from Mae Sariang towards Mae Sam Laep alongside the Salween, Laofang tells me that a lot of people in this region do not have information about or access to legal rights and many are taken advantage of because of this. He said that the ethnic groups in upland areas are especially vulnerable, since some do not have Thai citizenship and so do not have the same legal rights. Our truck climbs through the hilly road. Some parts of it are in good repair, while other stretches are full of potholes. Laofang explains to me how a lot of people in Mae Sam Laep are left in legal limbo because many agreements regarding the land they live in and the scope of land usage were established orally and never cemented into anything legally binding. Thus, loopholes exist. Laofang mentioned that those who understand the legal system better then sometimes exploit these groups. The road into Mae Sam Laep is narrow and the passing of two cars can be quite nerve-wracking. Many of houses are built alongside a steep drop on the side of the road. Laofang told me that these lands were given to many of the villagers for temporary use only, without proper titles, which means they can be easily evicted. 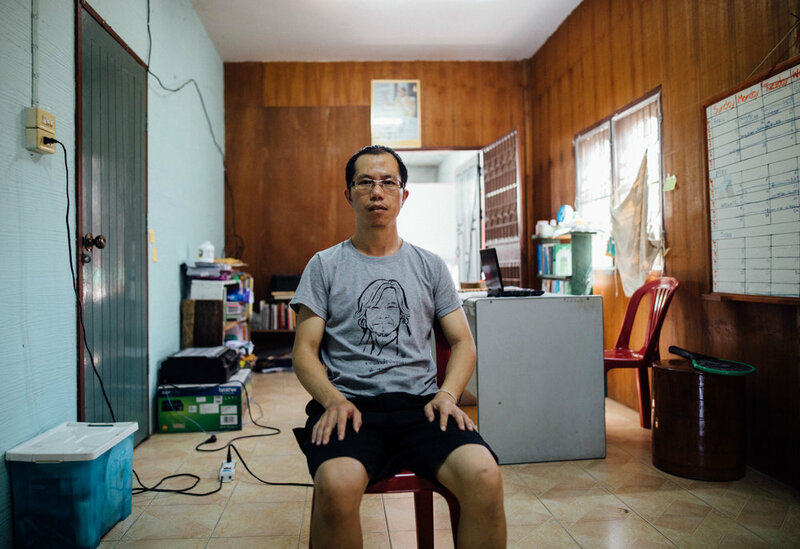 "Things are getting better" said Laofang, "but there are still people out there that are being taken advantage of because of their lack of legal knowledge." Our truck comes to a halt by the river bank of Mae Sam Laep village. It's quiet and serene. In a way it felt like a place that once had good potential, but the opportunity to grow into something big has now gone. "These days, traffic isn't as much as it used to be" Laofang says as he turns off the truck engine and grabs his cap before exiting the truck. I got out and looked around at the village, a few people were sitting by the river bank while occasionally a motorbike would cruise down the road. I was introduced to Tee Sae, a Karen boatman who had lived in the village since he was 12 years old. Tee Sae told me that he moved from Myanmar over to Mae Sam Laep because the war broke out between ethnic armed groups and the Tatmadaw (the Myanmar military). He told me about the history of Mae Sam Laep town, and the challenges and opportunities there. Over a couple of days in two separate trips with Tee Sae, I had an opportunity to learn what life is like along the border. Oshi Jowalu, Nek K'nyau Hpo and Reverend Sunny Danpongpee.